The land full of nature, surrounded by the ocean and mountains. Yuzuya Kankitsu Koubou atelier is located hillside of a mountain full of nature. Please drop in when you come to sight seeing. Shopping with drinking and eating the products fresh from the plant. You can chooose “Safe products” of synthetic seasoning or additive free. 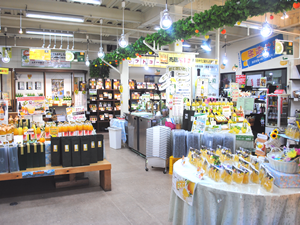 You can try the products ( juice, marmalade, yuzu tea, and etc.) and you can be convinced of the products and then you can purchase what you like. We, all the staff members will welcome you sincerely. You can try drinking and eating the products and after you are convinced with the products you can purchase. 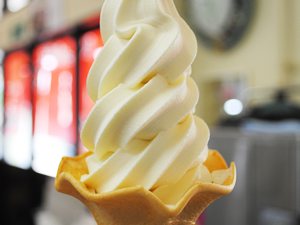 White Natsumikan soft ice cream of Yuzuya. You can enjoy the special flavor only here. 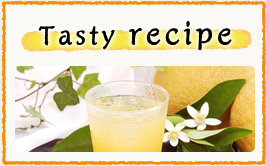 You will have all the fresh products with distinctive flavor and scent. 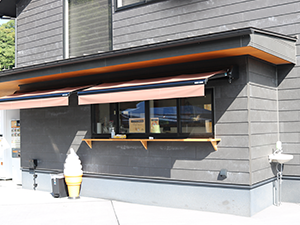 You can stay and have good time in this deck with fresh Kasayama breeze. 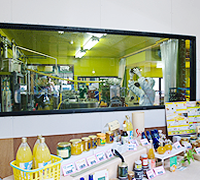 Huge yuzu nada panel Yuzu, Daidai, and Natsumikan are hand in handin the picture. . 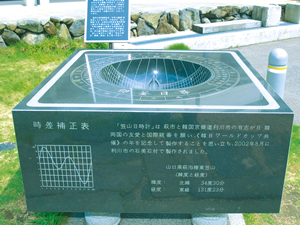 The design is peculiar in Hagi, Yuzunada Huge panel. 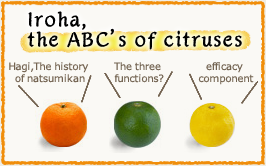 We are trying very hard to keep natural flavor and the scent with the raw citrus raised here in Hagi. 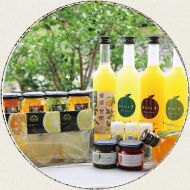 With the original manufacturing method to keep the natural citrus’ mild sourness and the scent and its color, we produce the products one by one politely. We are always careful about the food satisfaction and its safety and we pursuit the real deliciousness free from synthetic seasoning or additive free. You can see the matnufacturing line very close over the wide opened show window. please get off the Sanyo expressway or Chugoku expressway at Mine Higashi Interchange and take Ogoori Hagi free way. 40 minutes of drive from there and please get off at Edou interchange. 10 minutes of drive. You can take a taxi here, too. 60 minutes of driving or you can take Bocho bus and Iwami Koutsuu bus bound for Hagi. 90 minutes of driving or you can take share taxi of Hagi Kintetsu taxi. To the customers who browsed our Home page, we introduce the profitable coupon! 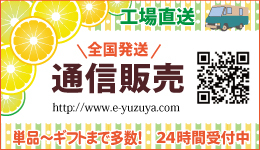 Printed coupon is valid only in Yuzuya’s Kankitsu Koubou atelier direct shop. When you order through home page or telephone, it’s not available. When you use the coupon, please cut off from the printed out paper and hand it to the clerk. Only one coupon for each person is available. You cannot combination use the other service ticket. You can’t use it for the other factory products or experience menu. Also, we’re afraid for the customer using bus tourist tour or sightseeing tour can’t use the coupon. 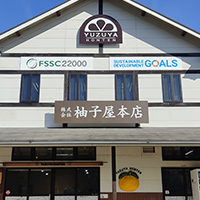 Copyright © 2019 Yuzuya-Honten Co., Ltd All Right Reserved.